I love the original Sin City. A star-studded ensemble cast in an ultraviolent, beautiful, and heavily stylized (essentially) noir film? That’s definitely my bag. I didn’t have much hope that A Dame to Kill For would live up to its predecessor and after having seen it, I think it’s safe to say that it didn’t. But for some reason, I’m having a hard time pinpointing why. 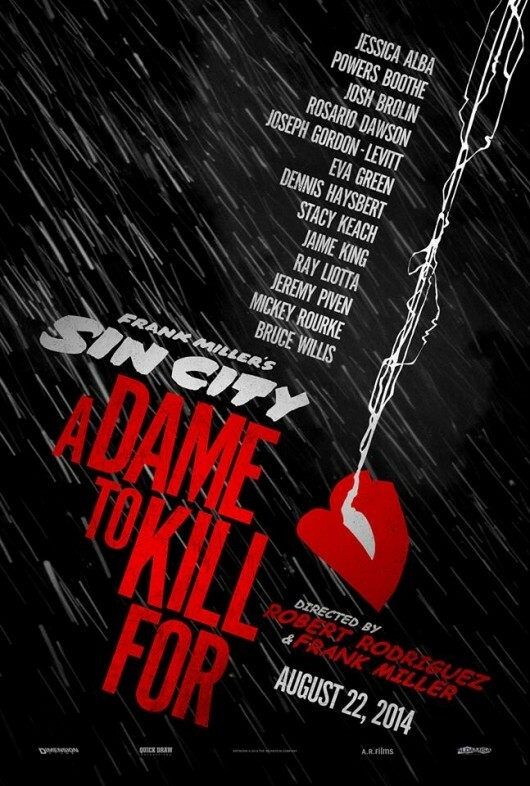 A Dame to Kill For, like Sin City, tells a few different stories, which are split and mixed together. It starts with Marv (Mickey Rourke reprises his role) finding himself staring at a bloody aftermath with no recollection of how he got there and then proceeding to piece his night together. Next we get Johnny (Joseph Gordon-Levitt), a card shark who hustles the wrong game. Halfway through Johnny’s story, we finally move on to the titular dame (Eva Green) who reaches out to her former lover Dwight McCarthy (Josh Brolin) for assistance. And we finish off by joining up with Marv again, who finds himself working with Nancy Callahan (Jessica Alba) to settle an old vendetta. The stories come together a lot more seamlessly than my description suggests. It’s hard to judge the acting in A Dame to Kill For by standard metrics because they simply don’t apply. The performances are without exception over-the-top, melodramatic displays, but while normally that would be something to criticize, they suit this world just perfectly (which is great for Jessica Alba). The real standout role was Eva Green’s devilishly beautiful and manipulative Ava Lord. I love characters who are difficult to get accurate, honest reads on, and Green plays every turn masterfully: you can never tell which of her faces are just masks. It was also a delight to see Mickey Rourke return to Marv, a character he seems to feel right at home with. Rourke is a natural at playing the gruff and violent yet lovable guy. As solid as the performances were, acting tends not to be the reason you watch a Sin City movie. It’s more about the cartoonish violence and near-excessive stylishness that pervades almost every shot. And while the movie looked about as gorgeous as you’d expect, it somehow didn’t carry the impact that the original held. I’m not sure if it’s a symptom of my having matured since I last saw Sin City (doubtful), but A Dame to Kill For felt far shallower. Part of is also probably an expectation that, in the span of almost ten years, something new might be brought to the table. On this front, A Dame to Kill For fails. That failure probably seems more pronounced because it doesn’t look like Rodriguez and Miller even attempted to bring something new to the “formula”. If you like Sin City, there probably won’t be a ton to dislike about A Dame to Kill For since it delivers about what you’d expect from a sequel. But there is an undeniable feeling that you’re watching something that fails to capture the magic of the original, even though all the parts seem to be there. I’ll wax poetic here for a moment: A Dame to Kill For’s greatest strengths are the things that it has in common with Sin City… but its overdependence on that formula, without offering anything new, was likely the cause of its downfall.